When it comes to recruiting talent, numbers speak louder than words – hence the importance of offering a compensation package somewhat in line with the candidate’s expectations. The good news for employers in Malaysia is that local graduates have one of the lowest salary expectations in the region. According to Universum’s latest global research, Malaysia’s graduates have the fourth lowest salary expectations in the APAC region, with business graduates expecting MYR39,188.45 (€8,485.45) per annum, and engineering graduates expecting MYR43,962.06 (€9,519.08) per annum. While the lowest salary expectation came from Vietnam, with engineering and business graduates asking for only €7,086 and €6,041 per annum respectively. 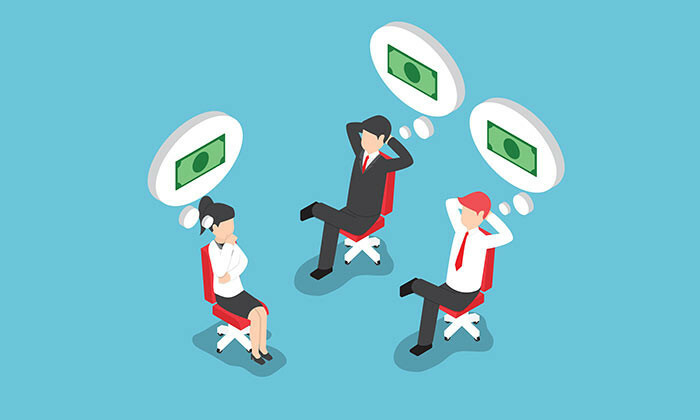 Digging deeper, the survey found that both in sectors, female graduates have lower salary expectations as compared to their male counterparts. While female engineering graduates in Malaysia expected MYR45,106.97 (€9,766.99), their male counterparts expected MYR 48,287.61 (€10,455.69). Similarly, where business graduates are concerned, female graduates expected significantly less than their male peers – female graduates expected MYR39,152 (€8,477.56), while male graduates expected MYR42,103.33 (€9,116.61). 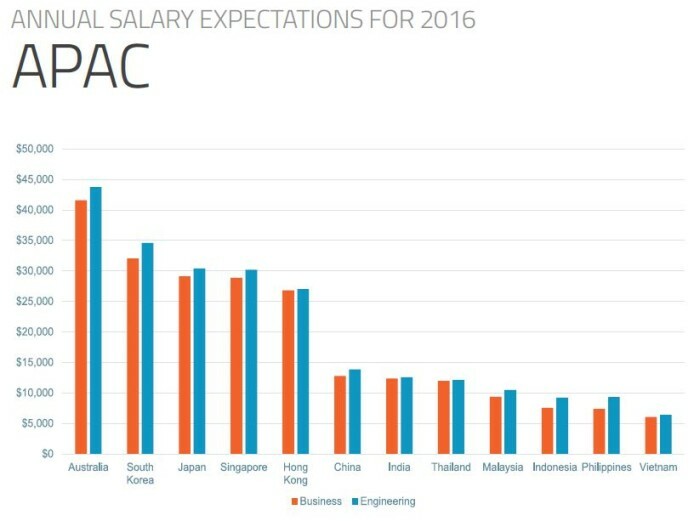 One of the APAC countries with higher salary expectations among graduates is Singapore, where business graduates expect to be paid SG$39,528.27 (€26,200.24) annually, and engineering graduates expect to be paid SG$42,683.46 (€28,291.58) annually. Similar to their peers in Malaysia, female graduates in Singapore expected a significantly lower salary package as compared to male graduates. In the business industry, male graduates expected an annual salary of SG$42,624.67 (€28,252.61), while female students expected SG$39,347.18 (€26,080.22). 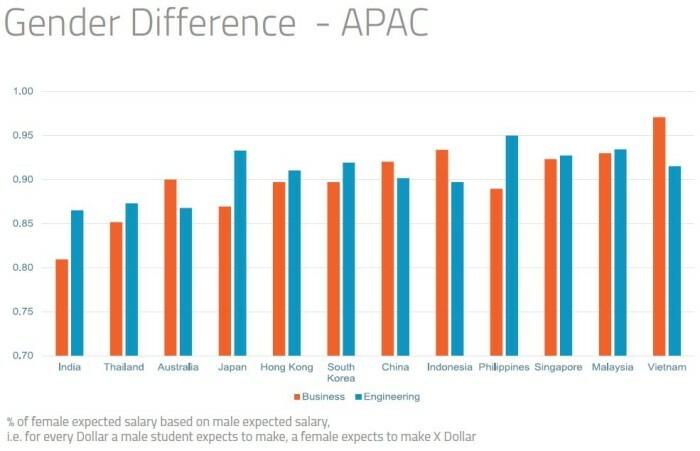 In engineering, a similar situation was observed with female graduates expecting about SG$2,000 less than their male counterparts – female graduates expected SG$41,332.71 (€27,396.27) while male graduates expected SG$43,505.95 (€28,836.74). As expected, Hong Kong – Singapore’s closest competitor to be Asia’s financial hub – didn’t fall far behind where graduate salary expectations are concerned. Coming up right after Singapore, business graduates in Hong Kong expected an annual salary of HK$209,657.70 (€24,322.17), while their engineering counterparts expected HK$228,346.9 (€26,490.27). The gender gap continues in Hong Kong where female business graduates expected HK$205,647.70 (€23,856.97) while their male peers expected a significantly higher amount of HK$229,299.40 (€26,600.78). On the engineering side, while male graduates expected HK$234,705.20 (€27,227.89), female graduates expected HK$219,928.30 (€25,513.64). Manpower Minister Tan Chuan-Jin shares the other top complaints, and the benefits of fair employment practices. ..